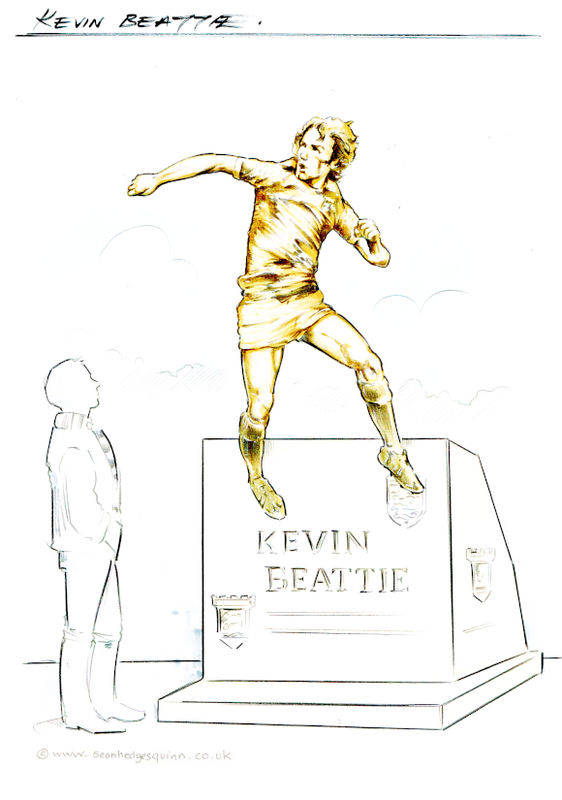 The design of the statue of Blues legend Kevin Beattie is today publicly revealed for the first time. Sculptor Sean Hedges-Quinn, known as Coach and the man responsible for the Sir Alf Ramsey and Sir Bobby Robson statues at Portman Road, believes his design captures the essence of Beattie, who died in September aged 64. Both the Beattie family and The Beat Goes On committee, which includes fellow legend Terry Butcher, were delighted with his plans. “Being an Ipswich Town fan and having known the player that he was, I came to the conclusion I had to capture the physical attributes of him as a player,” Hedges-Quinn said. Sculpting Beattie in aerial action presented additional problems and the committee were concerned that some statues of players in similar positions required substantial steel supports. 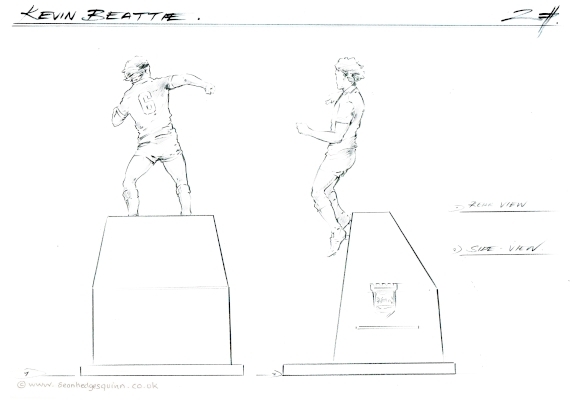 However, Hedges-Quinn has come up with a unique solution - “I haven’t seen it done before” - attaching smaller supports to Beattie’s feet with him appearing to float in front of a slanted plinth around 4ft in the air. The statue, which will stand along from his mentor Sir Bobby Robson towards the corner of Portman Road and Sir Alf Ramsey Way, will also feature Beattie’s trademark moustache. Brad Jones, editor of the EADT and Ipswich Star who are leading the project, said: “We are so thrilled with the design that Sean has come up with. Any fan who watched the Beat play for Town will recognise that Sean has captured his power and strength perfectly. Sean you've done it again! What a fantastic design and I can't wait to see it in place once completed. Brings back so many memories of a true footballing legend. Looks superb. Cracking work well done. Looks absolutely great. Very well done Sean. It looks brilliant. It’s him. An odd thing to say, but I’ve seen Ronaldo’s in Funchal Madeira. Hilariously bad! Bit of mud on the kit and knees and it is there. Three legends in a row never to be forgotten. I was wondering quite how The Beat's power was going to be represented,this does it. Great design, I would encourage anyone who hasn't donated yet to do so. Fantastic tribute to a fantastic player. I'm too young to have seen The Beat play, although I've watched the 78 cup final, but I'm loving the bold design here. A fitting tribute. Fantastic design! Seems quite original. Only concern is the possible ability to climb on the plinth - good for posing with the legend but might not be good for vandals/ people falling off!! Very well done Sean. Bet he's up there now heading those clouds free from pain and suffering. Not meaning to go against the tide on here but I don't think it looks much like him (if this is what the final sculpture will look like) the actual design and pose looks good though. Really great design.but don,t forget his moustache. I too have seen the CR 7 (Ronaldo) statue in Funchal and it is so bad I have to tell people who it is-----no problem with this magnificent piece of work-----it can be the one and only BEAT. Brilliant, it absolutely captures his essence. Excellent. I was lucky to have seen him play but I was young and the memory has faded. There are many who have not been as lucky. I wonder if the club could put together a disc or download of him best moments with profits going towards the statue costs. Would be great to see him playing again. Very impressive design. Great movement and power and a fitting tribute. Timmyh the statue when finished, will be very accurate In terms of beaties features. Sean’s attention to detail is amazing! Really looking forward to seeing it completed!